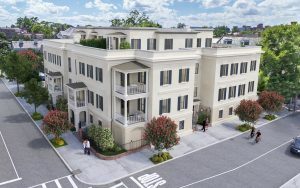 In the last few years a lot of new and exciting luxury condo projects have come to market with new ones coming up in Charleston SC that are even started so with all this new development, prospective buyers to Charleston probably want a luxury condo expert to help provide them with the best new luxury condo info. 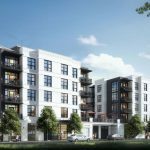 So, I wanted to highlight the best new and upcoming luxury condominium projects slated to come to Charleston in the next two or so year if you’re in the market for finding your own single family attached home. Some of these new developments offer both waterfront views, marina access, and some do not, it all depends on what you’re looking for. 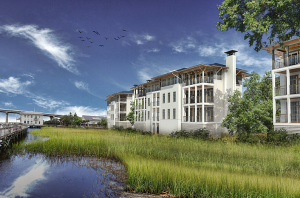 The Gadsen is located on the peninsula of downtown historic Charleston SC in Ansonborough neighborhood and is being built and developed by luxury condo masters East West Partners. The same development company who did The Tides IV in Mt Pleasant. The building project is still under construction currently, and many of the condo units have been purchased and/or have reservations. The condo is only blocks away from the Charleston Aquarium and Ferry ramp. Overlooking Gadsdenboro Park at 7 Gadsden St the project is a 5 story building featuring an owners club lounge, rooftop swimming pool, fitness center, dog washing station and more luxury amenities. CLICK TO SEE LISTINGS. Located at the prime location of Broad Street and Lockwood Boulevard along the Ashley River, the property will be made up of a waterfront park and 20 single-family attached townhomes just over 2400 sq ft. Each individual unit at St Mary’s Field will have their own formal front entries, limestone exteriors and large, expansive window areas to see the amazing views of the Ashley River & the Park so as to keep with design requirements consistent with that of the historic peninsula.The anticipated start date for the project is summer 2020 with a target completion date of late 2021. Prices have not been released. CONTACT ME DIRECTLY FOR RESERVATIONS LIST.